The One Day Film School for Producers! The One Day Film School for Producers is a professional development opportunity to learn the high level concepts on how to make and monetize film & video projects from successful industry veterans. This is a one day intensive course to learn new concepts, network with your community, and refresh yourself on things you may already know! Additionally there will be door prizes provided by sponsors, including an annual subscription to Adobe Creative Cloud. Pierre Bagley: a Feature Film Producer/Director with more than 35 years of experience in the media and entertainment industry. (Pierre also served as the director of the DC Office of Motion Picture and Television Development from 2014 to 2015.) Pierre is the producer, director, and co-writer of the independent feature From the Rough, starring academy award nominees, Taraji P. Henson (Curious Case of Benjamin Button), Michael Clarke Duncan (The Green Mile), and British actor Tom Felton (Harry Potter). He guided the project from development to production in less than six months and raised nearly $7.5 million in equity to complete the film. Other recent projects include two critically-acclaimed documentaries, A Legacy of Leadership, hosted by Sidney Poitier; and LAPD: Transforming the Dream, commissioned by former LAPD Police Chief, and current NYPD Police Commissioner, William H. Bratton. Kimberly Skyrme: A Casting Director-CSA/Producer. Her work includes Commercials, Government Agency Productions, as well as Hollywood Film and Television Productions that film in the area. She was the Casting Director and Executive Producer of the feature film TRI, which premiered April 2016. Her casting portfolio includes: the Emmy Award winning Netflix original series House of Cards - Seasons 1, 2 & 3; Unsolved Mysteries; Deep Impact; Hearts in Atlantis; Beloved; The Pelican Brief; True Lies; and Clear and Present Danger. Independent Feature and Short Projects: A Good Egg; Twice Exceptional; Death of a Nation; Group House; and Camouflage. Kimberly is a board member of the Chesapeake Film Festival as their Creative Strategist. She is also on the Advisory Board at the National Conservatory of Dramatic Arts in Washington, DC and The Arts Education in Maryland Schools and is a member of the Casting Society of America. Antonio Piedra: An award-winning music video and commercial producer. Antonio has produced for some of the biggest names in music including Pitbull, Shaggy, Missy Elliott, Lumidee, Ricardo Montaner, Shaquile O'neil, Kymani Marley. His talent for producing quality content with sleek imagery, bright colors and innovative graphics has made him one of today's most sought-after producers having contributed on projects for Make A Wish Foundation, Bank Atlantic, National Coalition Against Domestic Violence and KRS that can be seen on FOX, Comedy Channel, NBC and MTV. Antonio has produced several movies including the critically acclaimed cult classic "Shottas" starring Wyclef Jean and Kymani Marley and "Lost Everything" in 2010. In 2016, Antonio joined Universal Media Group and Akita Films to develop, produce and distribute feature content worldwide. His next film "Asphalt Jungle" goes into production in Spring 2017. Paul Marengo: Is the CEO of Promethean Fundraising, a small boutique consulting firm that advises grassroots organizations on how to become more competitive fundraisers. Mr. Marengo has 25+ years experience in non-profit organizational development. In his career, Paul has been the Festival Director for DC Shorts, the Asian Pacific American Film Festival as well as the Volunteer Coordinator for DC Independent Film Festival, DC Underground Film Festival, and now FilmFestDC. Further adding to his resume, Paul has been the event manager for organizations such as the Guerilla Film Festival and Reel Affirmations as well as a Theater Manager for the Washington Jewish Film Festival. Paul has been a film judge/screener for the NYC Independent Film Festival, The Washington West Film Festival, Smart Philm Festival, and many others. Brian A. Frankel: Is a business, entertainment, and intellectual property attorney based in Washington D.C. Brian’s practice includes contracts & transactional law, entertainment law, copyright, trademark, corporate formation, business strategy, and litigation. Brian has represented clients that include film & video producers, media distribution companies, screenwriters, Fortune 50 companies, technology startups, online marketplaces, social media & marketing firms, a professional athletic team, freelancers, podcasters, live event producers and talent. Brian serves on the Board of Directors for and as the Education Chairman of Washington Area Lawyers for the Arts where he has volunteered since 2007. Brian serves as the Executive Director of D.C. Filmmakers / D.C Media Makers and is the Festival Director for the Wheaton Film festival. Brian is also an award-winning independent filmmaker. He has produced and/or directed music videos, films, television shows, commercials, and multi-media projects. Brian’s past video clients include MTV, Spike TV, Motorola, M Audio, Def Jam South Records, the Merchant Marines, and the Independent Feature Project. 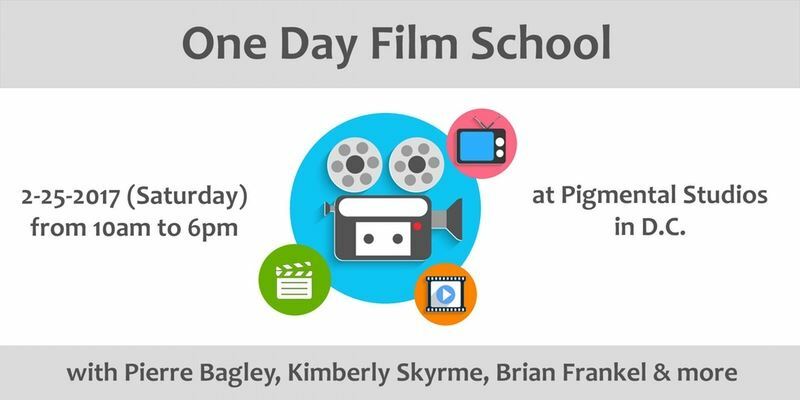 The One Day Film School will be hosted at Pigmental Studios, where renowned animation artists and technologists come together to share their most creative ideas, work with international production partners and produce groundbreaking new works. Pigmental’s talented group of artists include Iain McCaig (Harry Potter; Terminator 2; Guardians of the Galaxy), Marjolaine Tremblay (Birdman; Live, Die, Repeat; Hunger Games: Catching Fire), Stephen Platt (Ironman; Oblivion; The Day the Earth Stood Still) and David Krentz (Ant-Man; Guardians of the Galaxy; John Carter). To position itself as the premier, internationally focused animation studio in the industry, the Pigmental team chose Washington, D.C. to launch their new films. New films in production include KONG, co-produced with Aquamen Entertainment (China/Korea); and an animated feature with Sergio Pablos, creator of Despicable Me, which is scheduled for release in early 2017 (Spain). In addition to its film projects, Pigmental Studios is scheduled to launch an apprenticeship-training program for individuals interested in animation, which will focus on specific career tracks within the animated media industry as well as provide apprentices access to animator and production mentors. * Breakfast and lunch will be provided at no additional charge. If you have any special dietary concerns or restrictions, please bring your own food. Script format - length, 3-act structure, etc. TIVA members who want to attend can receive a special discount! $199 tickets code is "TIVA-skills-199". This will be valid until 2/15/17 at 11pm. It will allow the users to get a $199 promo ticket (+ eventbrite fee). The standard ticket is $239, that is reduced to 207.20 + fee. Afterwards, the discount code is "TIVA-partner20". It will allow a 20% discount (+ eventbrite fees) on both the Standard Ticket (available through 2/22/17) and the Late Ticket (available from 2/23/17 through 2/24/17).The late ticket is $299, that is reduced to 239.20 + fee. Address: Pigmental Studios 800 Florida Ave NE, Washington, DC 20002. Parking is free. The closest Metro station is NoMa–Gallaudet U station.